The Wednesday before the fly-in we were wondering whether we should cancel the event, try to reschedule the event, or just plow ahead and hope for the best cause the weather reports were pretty dismal. We elected to hold the event and run with it, and we were blessed with wonderful weather - once the early morning chill had warmed up a bit! 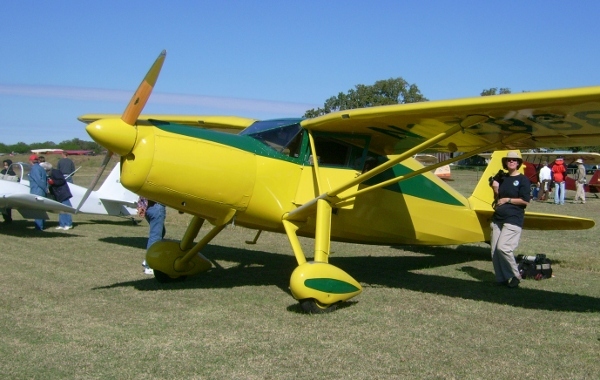 Ron Marcotte has posted a video of the fly-in on Youtube. We had a fairly steady stream of visitors flying in up through lunch, and a goodly number of drive in folks who continued to arrive throughout the morning. I have not seen an estimated attendance figure yet, or a count of approximately how many airplanes flew in, but it was one of our larger events! [Ed. note - about 35 airplanes flew in for the day - a nice turnout!] We had some gorgeous and very interesting aircraft fly in to help liven up the show. The museum flew our Meyers OTW, the Great Lakes, as well as the Canuck! 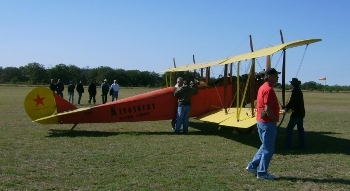 King's Hobbies set up a booth at the fly-in, as did Dr. DJ Heinrich - promoting his book about life lessons from the Red Baron. Jo Hunter was also selling her book of beautiful airplane photographs. Overall the event was fun and a financial success for the museum. Many people worked to make the event work well - and I'm probably not even aware of many of the contributions. But there are a couple of folks who really need to be recognized - Tom Miller, John Bush, Dave Miller, Miller family members, Johnnie Bush, and Tammy Orloff. These folks managed the gates and the food service as well as T-shirt sales and were instrumental in the success of the day. Thanks also to Al Sumrall for coordinating the re-enactors. Those folks definitely were an attraction during the event! No question the fly-in was great but the "drive in" part was a banner day for Team Vehicles & friends who brought vehicles and the living history friends who attended. Thanks to the effort and contributions of so many, we had more vehicles running than ever before. The only mar was that the Ts were compromised with not enough hot batteries. So it was a matter of swapping out good batteries between three vehicles. The situation got so bad that Tom Moore and Johnny Bush sacrificed some of their air fair time to purchase one new battery to supplement the mix and they made a battery run. However, we did get some driving and riding in. 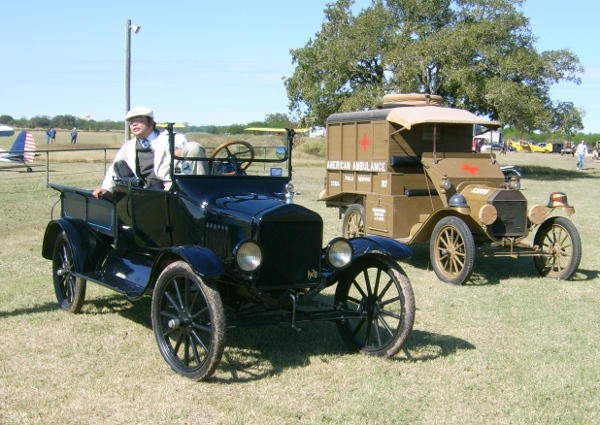 We also had a duster coated gentleman, Will Rice, who brought his 1920 Model T from Houston. 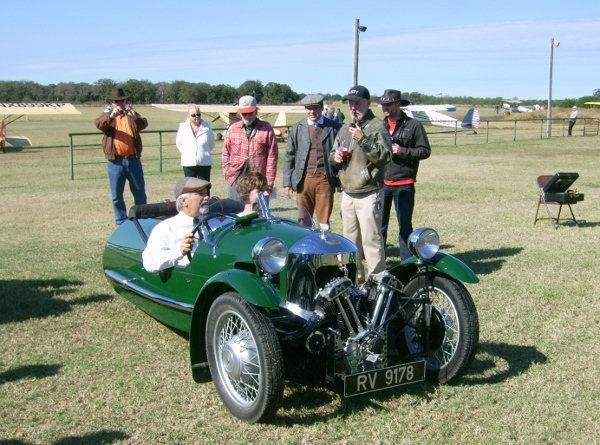 To a great extent the not quite so prevalence of the Ts was overcome rather well by the 1921 Triumph and Indian motorcycles, the visiting touring car, and the Morgan and some hot rods and motorcycles came in. Thanks to Duncan Charlton who got the Triumph up and running and then several of us got going on it so we had a lot of first time riders and it was AWESOME. Of course Doug Horvet (who I think did more aircraft duties this event) spent many days getting the Indian to the point that Dave Whitaker was able to take the Indian to the next step. It is far from 100% in operating condition, but it is running, and many, many people got rides in the sidecar (Roger's original idea I believe) and also different folks got to try their hand on the bike. Another AWESOME experience. For those of you who don't know Dave he was the guy in the blue long sleeved shirt with "Indian Motorcycle" in red on the front and he kept the Indian going despite a ball bearing glitch in the mag kept him improvising but he got 'er done. Back to Duncan. In addition to the Triumph contribution, he brought his immaculate 1934? Morgan three wheeler, the king of the "Cyclecars" imo. It hopefully will be featured in some photos (I had no time to take any but hopefully folks will share)....just pristine and running like a charm. Duncan came dressed in white shirt and tie, and looked the part of a 1930's Morgan enthusiast. Now where was Lynn and Killer while all this is going on? Lynn was doing his typical troubleshooting of course, model T driving (and towing on two occasions) and with these old vehicles there is always troubleshooting. Lynn of course is "Quad King" and when the opportunity called Lynn pulled together a bunch of us and the Quad started, although not quite as easily than last go round. We need to give the Quad some more exercise to keep it happy. An additional troubleshooter who went to whatever was not quite working right was Cameron Whitaker who was dressed in bib overalls and cap (this is a very good and easy impression for the period - hint, hint to those who have still not bought into dressing the part) and he also entertained us with the pop pop pop coming out of his Maytag Flyer that he built. Not everyone in the teens, twenties, and thirties, even the forties and fifties, could run over to a store and buy what they needed, they often had to make it from available resources. The Maytag represents this home-made ingenuity. Now for the additional living history element, featuring both the subtle and the near overwhelming, the measure being the enthusiasm and the interest of the individual. All facets added to the great mix of people and costumes, from wearing just a hat to full fledged authenticity down to the shoelaces. Not only did we have volunteers "living it up" but also many new guests contributing to the fabric and pagentry of the air fair. Many of the volunteers have been going over to coveralls or bib overalls. I saw Dave Orloff, Dave Edgerly, Terry Bledsoe (Terry and Dave E looked like they were "company" mechanics with gray overalls and long sleeved red shirts and paperboy hats (the most common hat of the era) - per Terry this was just a co-incidence but it looked great), and Ron Marcotte in coveralls with aircraft company logos of the period painted on the back. I know I saw Curtiss, Lockheed but I can't remember the other names. Bib overalls were seen on John Bush and Cameron Whitaker. The more sartorial elegance set of the period was represented by Duncan Charlton as mentioned above Gentleman Kurt Maurer in his bowler hat and bow tie, Gus Martinez, and Chris Sauld mentioned below. Ian Whitaker as Lt. Von Whitaker showed some good humor in allowing himself to be forced down in his D.VII and captured by the French and a Lady in a parasol. I also saw Ian giving rides in the Indian and also driving the Quad. More Ian below. 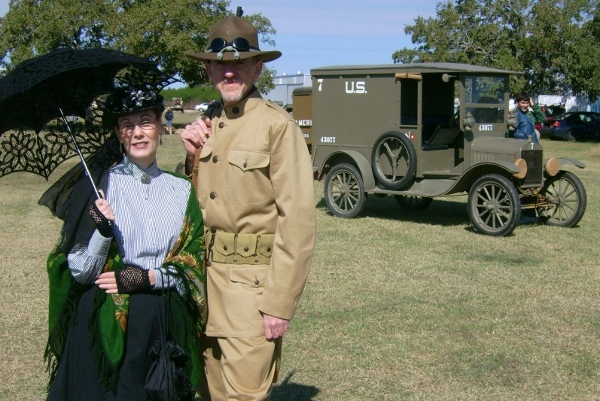 Friends from the great Northwest (Fort Worth) came down to visit and add impressions to the group, Kim Tolar came in early US 1900-1930's uniform and accompanied by Ms. Chris Sauld in more formal Edwardian-WWI ladies attire which really "classed up" the event. Chris's parasol will hopefully be seen in some pics of the event as photo opportunities in many of the vehicles were taken. On a more heroic note intrepid explorers came from the great Northeast (Dallas) came and camped at Kingsbury and braved cold and flood (Friday night) of biblical porportions which was pretty much the equivalent of the train disaster scene in "The Greatest Show on Earth". 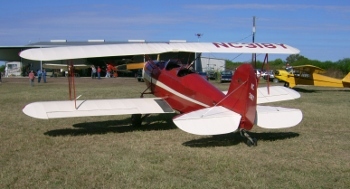 However, like those doughty circus entertainers in the film, the show had to go on and Toby Hazelip, Marcie Rodriguez, Alan Olson, and Theresa and James Almand gave various period civilian impressions both (adventurer/archaologist types and aviation related) after having enduring the great hardships to do so. Alan also threw in a WWI French flying observers impression and captured Ian after he was forced down in his D.VII. Ian then soothed his wounded teutonic pride by giving rides in the US Indian motorcycle he captured. Also special thanks to 2nd Lt. James Morris, whose 1918 uniform on a mannequin as officer of the day greeted automobiles as they came in, he looked alive there by the flapping US flag.